take your life back. Without apology. A personal blog of confidence. Look, idontgiveacrap about buying a new car, what kind of cell phone service is available or even what is on sale at the local hardware store. Commericals. What is the point of them? They are a big interruption to my favorite show! The program needs them as a sponsor to get the show on the air! My solution? I pick up, clean up and get things done! Ans what do I miss? A three minute spot that tired to sell me on a local eatery I will never go to, feminin products I will never use or a destination I have no interest in ever visiting. Laundry is started. Dishwasher is loaded. The trash is taken out. A few shirts are ironed. idontgiveacrap about commercials on broadcast tv. So, i used the time to get the things done I needed to! Have an idea or a comment you would like to share with the team? We love to hear from our fans! 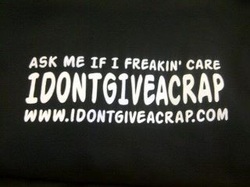 Random selected enteries each month will win an exclusive idontgiveacrap t-shirt!